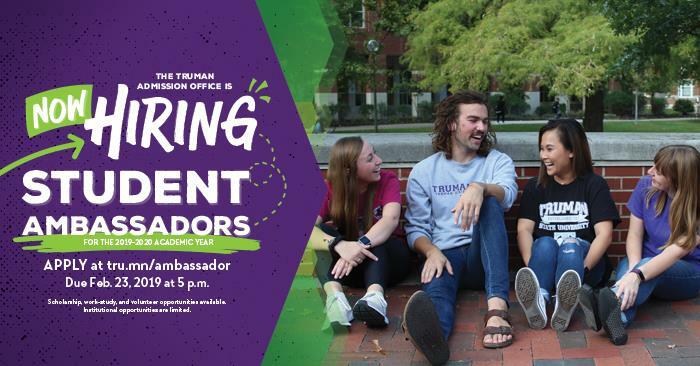 The Office of Admission is looking for enthusiastic student leaders with a passion for sharing their positive Truman experience. Applications are open for student ambassadors for the 2019-20 academic year. Student ambassadors guide visiting students and their families on campus tours, assist in the recruitment of prospective students and positively represent the University. Scholarship, work-study and volunteer opportunities are available. Institutional positions are available, but limited. Applications can be found online and are due by 5 p.m. Feb. 23. Questions should be directed to Shari Fieser, student ambassador adviser.